This product comes with 12-month warranty. Any confusion or problems on setup, any details inquiry on the item is welcome very much. We promise to provide you with good customer service. USB 3.1 Gen 2 Port support the speed of data transmission up to 10Gbps,give you a steady and efficient data transfer.Downwards compatible with USB3.0/USB2.0. Professional Aluminum Case,Ultra slim design for a modern look.Provides heat dissipation and data saver for your systems. Compliable with NGFF M.2 SSD 2230 / 2242 / 2260 / 2280;Hot-swappable,Plug and Play,No Driver needed. 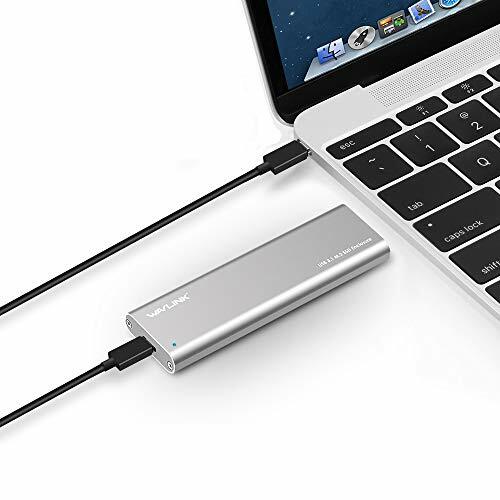 What We Offer: 1 x Wavlink USB-C NGFF M.2 SATA External SSD Enclosure Case;1x USB C to USB 3.0 cable;1x USB C to USB C cable;1 x Screw driver; 1 x Instruction manual; 2-year warranty quality guarantee, 24h friendly customer service and email support.